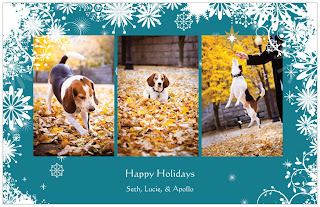 Every year our holiday card features our beagle, Apollo. This year we did a little shoot right in our neighborhood in a spot that had vibrant yellow leaves, the color was amazing! I let him do his thing (with some "instruction") and wound up with these three photos for the card.